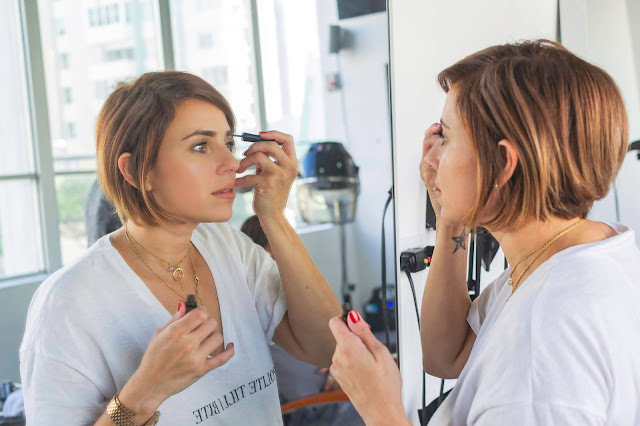 Hairstylist Fabi Santos on Life Struggles and Finding Success | Voilà-Madame! 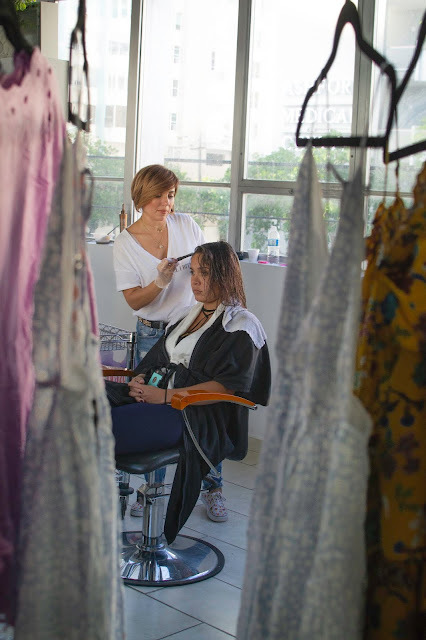 Fabi Santos is a talented hairstylist from Puerto Rico who has proved to herself and others that creating a successful business literally means hard work and learning from your struggles and past experiences. Little did she know, when she was 18 years old and pregnant with her son, that she would become one of the most successful hair colorists on the island. A few months back, I sat down with her to get to know what made her defy all the odds that society puts on teenage moms and become a successful businesswoman. What was the defining moment that inspired you to become a hairstylist? When I was in college and being a single mother, it was always a constant struggle moneywise, and I found myself doing different odd jobs to support my baby, my mom that was ill at that time, and myself. One time, I was working for a modeling agency, and for an important event, I decided to do my own hairstyle without knowing much of what I was doing. When I arrived at the event, my boss told me that I did a fantastic job with my hair and that he was impressed. He started talking to me about the beauty and hairstyling industry and that I had a natural talent and that I should give it a try. I never saw myself doing something non-academic. At the time, I was studying forensic psychology and my plans after I finish my bachelor's degree was to start a master's degree immediately. I never saw myself as a talented person on something, so, for me, hearing somebody saying that I was talented, it was shocking. So, my boss convinced me to go to one of his friend's beauty salon to assist him from time to time and to see if I liked it. And that was it. I was sold, and I find myself loving the business even more than I expected. I saw for the first time in my life, a future for me and my son. I remember one night coming home and taking a pen and a paper and narrowing down all the pros and cons, even how much money I would make if I decided to make hairstyling my new career. Perhaps it was the impulsivity of a 20-year-old or the fact that I realized that I was not happy with what I chose to study, but that night, I decided to do a leap of faith and decided to quit college and start a career as a hairstylist. And it was one of the best decisions that I ever made because I found myself doing something that I love, and it became my passion immediately. In the beginning, it was not easy, and, like in every important decision in life, there are moments that you doubt yourself, but somehow I was so sure that I was doing something great for my kid that it motivated me to keep going and not give up. After this life-changing decision, today, what do you like the most about your job? What I adore about my job is that every day I'm giving women another tool to feel confident and to love themselves even more. In a way, I'm helping them to recover self-reassurance. A simple change of hair color can do wonders for a person. How can you manage your career and single parenting? I think what helps me the most to manage a time-consuming career and be a single parent was the fact that I was focused on my goal. And my intention was not necessarily being a successful hairstylist. It was more to give my son everything that I couldn't have. I wanted the best life possible that I can afford for him. Also, I was lucky to have the help of my son's father and his family. They gave me all the support that I needed for me to keep working long hours at the salon. There were times I felt guilty because I thought that I was not doing enough and that I was not present enough in my son's life. But they gave me all the love and comprehension to make this work, and I'm forever grateful to them for that. For you, what does being a successful woman mean? A successful woman is one that is free from all her actions and decisions. She is one who cannot only imagine what she wants in her life but who can also make it happen. Success is doing what makes you happy and taking time not only to work but for yourself also, to keep a balance. What advice can you give to a woman that wants to become a hairstylist? From my own experience, I think the best way to learn is to assist another hairstylist. If you can attend beauty school, do it and take the most out of it. But for some people, attending beauty school is too expensive, so I believe the best advice is to start from the bottom assisting someone even if that means being the shampoo girl for a while. But if you are motivated and you keep focus, you will learn a lot. Orgullosa de ti. Gracias por agradecer a nuestra familia. Siempre te apoyaremos. Muy orgullosa de tu tenacidad y manera de buscar tu felicidad y la de tu hijo! Eres admirable como mujer, madre y estilista!!!! Muy orgullosa de tu tenacidad y tu contante busquda de la felicidad para ti y tu hijo. Eres admirable como mujer, mamà, amiga, emprendedora y estilista!!! Siempre contaràs conmigo!